In 1987, Nike introduced the Air Safari running shoe. 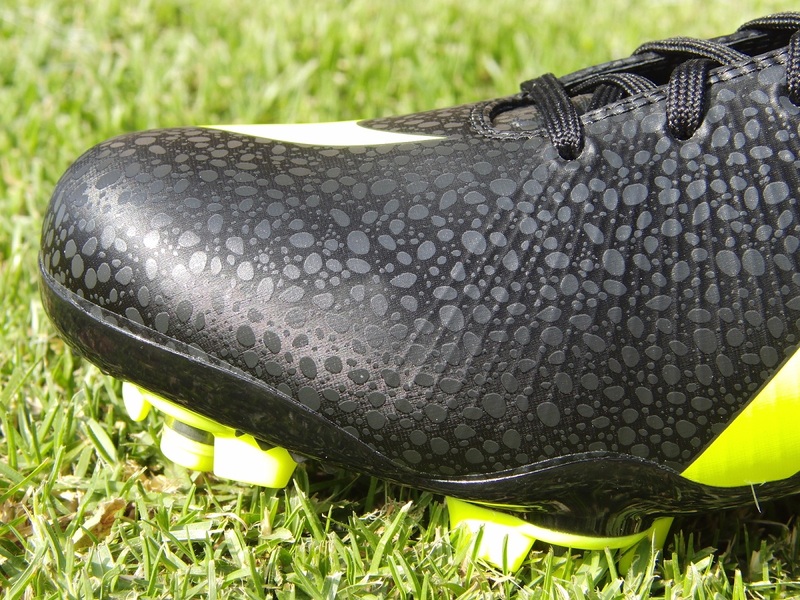 This is the first time that Nike has used the same leopard print design on a soccer cleat. Again, I encountered a difficult time with a Nike Elite soleplate! Nike uses a carbon fiber soleplate to decrease weight, but in my opinion this ends up creating a difficult challenge to break them in. Through the first few training sessions, I could only wear them through jogging because of how stiff they felt as I attempted to make quick turns. They caused some cramping along the sole of my foot through wear, but eventually I felt comfortable enough to wear them in full training sessions. Overall, it took probably 8 training sessions and some wear around the house before I felt like they were broken in and ready to use in-game. If you decide to get a pair, make sure you are willing to spend some time getting them into game shape. Performance wise, the Superfly III produces an overall tidy reward. 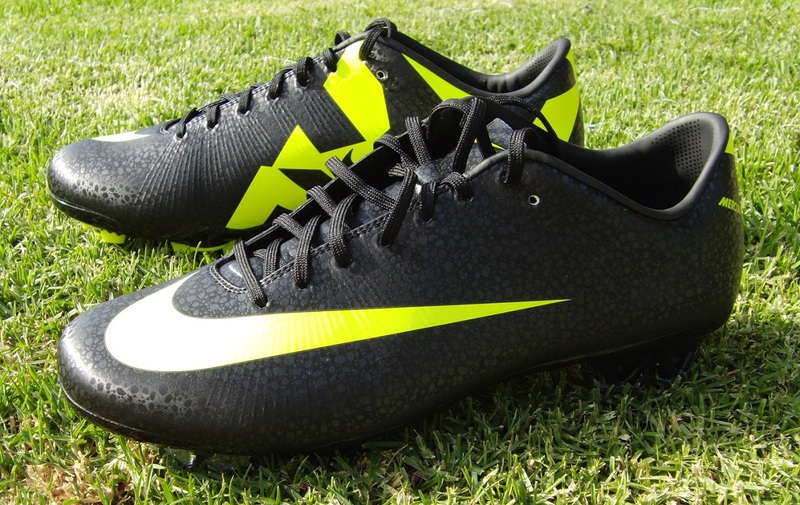 The two advancements with this boot are the use of Flywire, and the adjustable studs. Unlike technological advances seen on other boots, you are not necessarily going to notice either addition on the Superfly. Flywire is designed to act like the support cables on a bridge by taking and holding the majority of the weight of the upper. This allows Nike to decrease the required materials and produce a lighter boot. You will notice that they feel light on your feet, but it is not something you will actually attribute to the Flywire. The adaptive studs are a very contentious addition to the boot. In theory, the studs have the ability to dig into a firm natural surface as you put your pressure down on the sole. It is something that is very difficult to actually see in action as the boot needs to be in contact with a surface as you put your full weight down. I’m not a huge fan of what they offer and feel they are a little gimmicky! During testing, I liked how the Superfly III performed. They offer a well-protected, lightweight feel and are effective on the ball. Technology wise, I feel like Nike could do with toning things down and making things a little more basic. Unlike other Nike Superfly reviews, I decided to move up a half size to get a better fit. One of the important characteristics to remember about the Superfly is that it uses Flywire through the upper. Flywire is designed to keep the upper in place while lowering the weight, and as a result it does not allow the synthetic to stretch. The extra half size made a huge difference and the extra space allowed for a more effective fit in game. If you currently wear the Vapor VII, look at ordering a half size up. When they were finally broken in, I found that they are quite a comfortable boot. You definitely need to be patient with these and work on allowing them to mold to your required fit! The official colorway for the release is Black/Volt/Dark Shadow and I like them a lot! The initial White/Black rollout never took my fancy, but this version looks really stylish. The surface has a unique textured feel due to the smoother overlay print. This overlay also has a metallic look that makes them pretty easy to spot under lights. 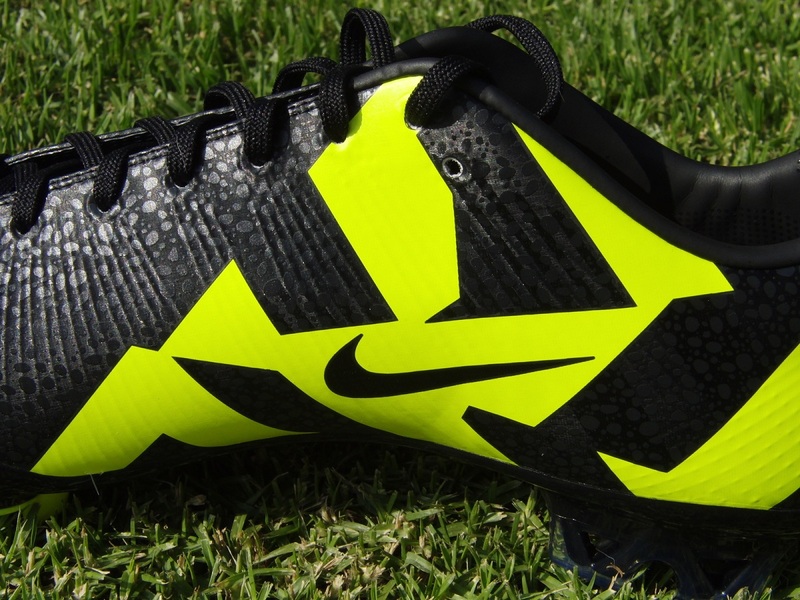 Nike has also visually enhanced the boot with the addition of a very bright Volt Yellow geometric design along the inner side of the boot. The actual positioning of each piece does not hold any significant value; it is more the randomness of the design that makes them eye-catching as you run. Feedback from some of my teammates verified their effectiveness. Finally, Nike has increased the surface area covered by the Flywire, and this is easy to spot if you look along the side of the boot. It now runs from the midpoint of your bigtoe right around the heel of the boot. There are two negatives that immediately spring to mind with the Superfly III. First off is the soleplate and the difficulties it creates through the break-in period. The same issue occurred with the original Superfly, so it something the Nike needs to address. Second is the price. Why Nike feel the need to give these an astronomical value is beyond me, especially when the Vapor VII offers an all-around higher, more effective, performing boot for around half the price. What it all means is that if you want the total Ronaldo experience, you will have to fork out big dollars! Nike has crafted these boots to the exact specifications of Cristiano Ronaldo, one of the world’s greatest players and a star who has mass appeal around the globe. The design gets thumbs up from me, with the black on black print offering a very fashionable look. But there are aspects to the boot that need to be considered before you decide to fork out big money for a pair. The break-in period turns out to be tough with the soleplate offering a stiff feel, while you also need to be aware that the effects of the technology included are not going to directly noticeable when you wear them in game. Worth noting, there are two other colorways currently available in the Superfly III range that offer alternative looks, a Red Plum and a Photo Blue. In term of positions, I can see midfielders and forwards benefiting most, although I can also see defender’s sporting a pair since Flywire offers some additional protection to the upper. This is a perfect example of why consumers have flocked to the adizero and now the new Predator. The very idea of suffering through 8 training sessions is ridiculous. When I buy a pair of boots I expect them to be comfortable from the first day. This is why I buy leather boots. I do not want to have any discomfort. Comfort and fit are the two most important things to consider when buying cleats. I would rather wear copa mundials than go uncomfortable just for looks and gimmicks! Since they are so uncomfortable you should have given the comfort score a 2 or 3 at best. I am definitely one of those consumers who flocked. I've worn nothing but Vapors, till this year. And I already have purchased two pairs of the Adizero. They are really unmatched, and you can't bet the price. Especially now, during the off season, when you can get the older colorways for a fraction of their original price. I used to be a huge Nike "fanboy," but the only Nike shoe I would purchase right now would be the CTR and/or the Tiempo. But that's without ever trying out Adidas' answer to the both of those, the Adipure and new Preds. So that isn't even a reliable statement. Ha. I don't know about your Mercurials, but my F50s have ten times better traction than my Mercurials ever did. 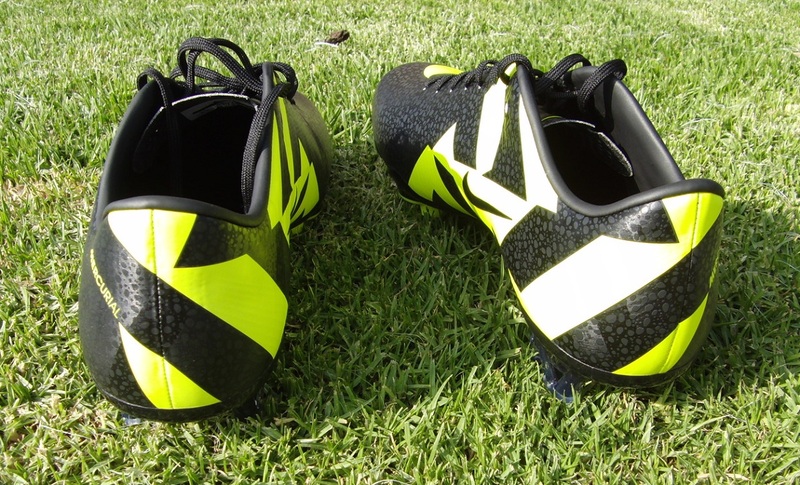 The studs on the F50s are great, and the way they are placed works perfectly together. And I'm not hating on the Mercurials. Like I said, I used to wear nothing but them, and I agree, they are great boots. And definitely serve their purpose on the field. But the F50 does everything the Mercurial does, and some even better, for a fraction of the price. Even the F50 Primes are 100 dollars cheaper than the Superfly. And Adidas offers a leather option. Which, in my opinion, is one of the best boots on the market at the moment. A wnoerdful job. Super helpful information. Nike Vapors have been great for me. I wore a pair vapors to a game withought even breaking them in. They worked well for me for that game. After that game i played some other tournements with some vapors and i didnt get any blisters from them. It didnt take that much time to break in and when it did break in they were FANTASTIC. I never got any blisters from them ever again. If they take sometime to break in from some people, they are totaly worth it. The initial $400 was out of the question. Ronaldo wears custom pre-molded boots designed for his feet. idk i really like the design of these. my friend Jose has the vapors with the silver bottom, and i think the black carbon fiber would look even better!! Misprint – the numbers were off! It's the next Tiempo. The Tiempo IV. It's set to come out next month, in that color you saw and a white and blue colorway. It's supposed to be a lot lighter than the current Tiempo, and come with a new heel counter. That's what I've been hearing at least. We will definitely see more within the next week or so. Especially now that they got that kind of attention. HI arent the laces ment to be same pattern as boots i buy these for my son he has both white and black and laces are same as boot in you picks they are not… ?? look like fake china ones . I think you are getting confused with the original Superfly Safari release, which had the black/white laces. This is a black/black release so the lace pattern is black like the boot! I'm very confused about the weight of these boots. The "official" weight of these boots are supposed to be 210g, which is 7.4 oz., not 7.8oz. as stated on this website and many others, which is also supposed to be the weight of the Superfly II's, which are supposedly the same as these. 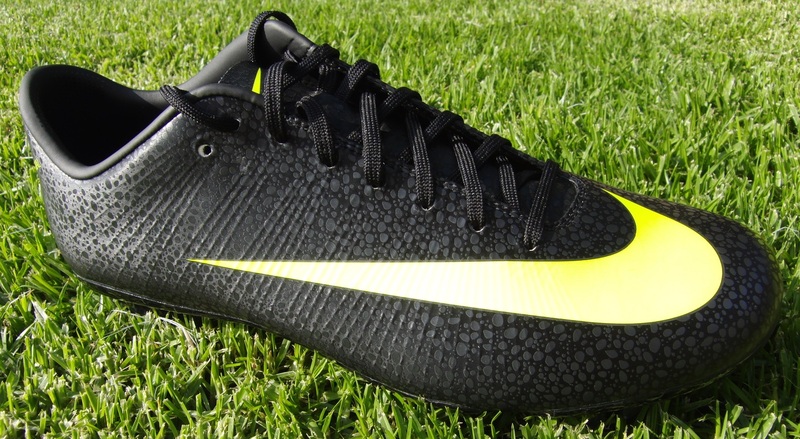 Also the elite version of the Superfly II's are supposed to be 5% lighter, which would be 7.4 oz. if the regular Superfly II's are 7.8. If the Superfly II's and Superfly III's are supposedly the same "official" weight at 7.4 oz., then the Superfly II's elites would weigh in at 7 oz., which doesn't sound right. Btw, I have both the regular and elite versions of the Superfly II's. Please clarify the weights of the Superfly II's, Superfly II elite's, and the Superfly III's. Thank you so much! The Superfly II and III weigh in at 7.8oz. I am not sure what you are referring to with the Superfly II Elite? 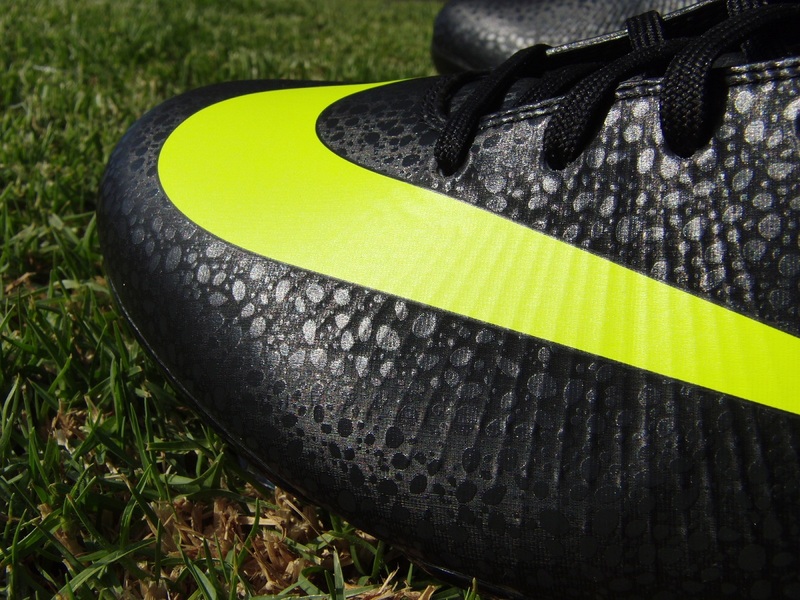 The Superfly is the Elite version in the range. Either way, don't get too caught up over the weight, 0.2oz won't make much of a difference. Hi, I currently wear size 7.5 Vapor VII’s and I have about half a cm of space. If I buy Superfly III’s which size should I get if I want them to fit me without space between my toe and the end? Thank you. How do superfly iii’s run length-wise compared to vapor vii’s? does anybody have a suggestion on the best-looking mercurial colorway. I went half size up and I have room in the toe area about width of my thumb. do you guys think I should go half size down? i have the superfly ii and iii… and i bought this one a half size lower than the iis because i wanted a skin tight feel… if you dont mind fighting some blisters for a better touch then yes go a half size down… if you rather have no blisters a sacrafice some touch then go for it.. its up to you! i wear a size 9 in tiempos, what size would i be in superflys? I was going to ask, do the superfly 3's perform better than the vapor VII"s? I was asking because I did not like the vapor VII's and was hoping if the superfly 3's are any different. hi there, y do footballers able to fit into the uncomfortabke feel of the boots? Please help, if I am a size US 10.5 in adipure 3 with half an in inch of room, would a superfly 3 in size 11 be too big? To be honest, I would go with the adiZero Prime since the prices are much better at the moment. Plus, Nike FlyWire makes these tough to break in. hey bryan do u have to go half a size up for these boots? Yes – half size up is key…read the comfort and size section in the review. I'm hoping someone can help me out. I don't know a bunch about cleats but last summer I bought a pair of these from Dicks. If I remember correctly they had 3 different pairs of the Superfly III costing different amounts. The difference was the bottom of the most expensive pair had this silver carbon fibre throughout (or so an employee told me), the medium price had it only on the heal, and the cheapest didn't have it. I bought the medium priced one and now none of the pairs I find online look this way on the bottom, and I'd like to purchase the same cleats again. Anyone have any idea? From your description, it sounds like you were looking at the Mercurial range. The Superfly is the top end release (retail $400), the Vapor is the professional version (retail $200), the Miracle is the top replica release ($140) and the Glide is the low tier ($80). It sounds like you purchased the Miracle – check them out at WeGotSoccer and let me know if they look similar! Thanks so much! That makes a lot of sense. Unfortunately it seems impossible to find the Safari print available still from any legitimate looking websites anymore. Do you think they will come out with new colorways for the vapor 8s? If I spend that much money I want to like the color of the cleats I'm wearing. Whoops for some reason on this laptop it had my name saved incorrectly. Thanks from the original commenter. hi bryan didnt you wear size 9 for superfly 3? do u need to go half a size up for this one? Read the "Comfort and Size" section above for more details! Hey Bryan, I need your help with sizing. I wear a US 8 in the adizero; however, I don't know how I should go about sizing in the Superfly III or Superfly II. In truth, I feel like all the Nike releases seem to fit differently. My adizeros are extremely tight fitting but that is simply how I enjoy my boots to feel. 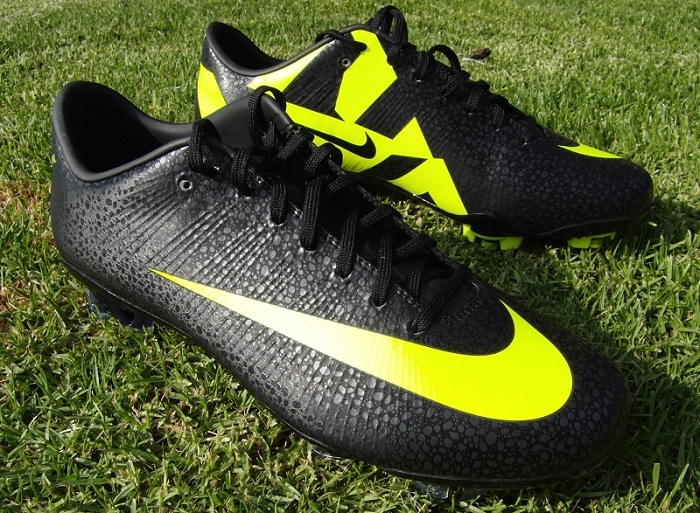 Shoot I also get a US 8 in the Superfly/ Vapor range? The SuperFly fits a half sizes tighter than the adiZero – so definitely look to order at least a half size up to get a comfortable fit! How about the new Mercurial Vapors recently released. Should I do the same for those? Bryan, I was just wondering if you recommend the superfly III to players with a wide foot? The Superfly is extremely tough to purchase right now, so if you are buying a pair make sure it is from a reputable source!! In terms of the actual boot, I strongly advise AGAINST buying the Superfly. They are overpriced and the use of FlyWire constricts natural foot movements.